Rustic log 4-Bedroom cabin known as Molly's Cabin is surrounded by grassy lawns and has Greer Valley views from the front deck in the center of the Greer Village. Greer is a gem in Arizona's White Mountains where you can truly escape. Just outside your door, you'll enjoy our stocked pond with catch and release fishing on-site at Antler Ridge, green meadows and a lush forest of Ponderosa Pines and Aspen during summer, beautiful fall colors peaking in October, and great skiing 20 minutes away. This beautiful home has a wood burning stove, large living room and a fully equipped kitchen. There is a small table and chairs on the front porch and an outdoor dining table plus charcoal and gas grills. The two bedrooms downstairs share a bath and each has a queen bed. Upstairs there is a large bedroom with 2 full beds and another bedroom with one queen bed that share a bathroom. The bedrooms accommodate 10 comfortably, 2 to a bed. For extra guests, we have 7 adjacent, 2 to 5 bedrooms cabins also available for rent. It's a short walking distance to restaurants, cafes, hiking trails in the National Forest, and fishing in our in stocked pond, the Greer Lakes or Little Colorado River. Kids love the playgym and large grassy lawns for play or sledding in winter. Both from New England, the owners George and Dawn Darling wanted a cool, summer mountain getaway for skiing, hunting, sledding and snowmobiling in the winter, and for hiking, biking, fishing, 4-wheeling and ATVing the rest of the year. The property was developed in the 80's and many improvements have been made including the adjacent 5-bedroom Ridge House built in 2009. The on-site managers, Traci and Laith Hensley, have been managing the property for about 3 years and the guests love them! Greer is a place where you can get away from it all - the traffic, fast-food restaurants, and a face-paced city life. it's great to just walk out your door or drive a few minutes to our favorite spots. Greer is a small mountain village where you can have the conveniences of home without the stress. It's quiet but not too remote. You can walk to the oldest lodge in Arizona for dinner and a drink at the bar, or across the street to fish for native trout in the Little Colorado River. Antler Ridge is located in the center of town within walking distance to just about anywhere in this unique Arizona village with a year-round population of only 125 and less than 700 lots developed with beautiful vacation homes. It's the closest town to Sunrise Ski Park, Arizona's largest ski area, without the heavy traffic from Pinetop. You're on the slopes in 20 minutes and snowmobiling or cross-country skiing on developed trails just 10 minutes away. Kayaking or canoeing on the 3 Greer Lakes is only 2 miles away and there are many beautiful hiking trails in the forest minutes from your door that extend throughout the National Forest. Greer is also located in Arizona's Area 1 with some of the best elk hunting in the country. Views of the on-site stocked pond at Antler Ridge Cabins and neighboring ponds. The Little Colorado River is across the meadow. All kitchen, bedroom & bath linens provided. Woodburning stove with wood provided. Large lawns for relaxing, sledding and outdoor games. Picnic table and grills. On-site staff in Antler Ridge Cabins office are available to assist with anything in the cabin and to fix anything not working properly in the cabin. In the office are extra supplies, linens, information on Greer and activities, movies, games, magazines and books. Cabin is cleaned for a fee after check-out. Cleaning during your stay is available for an extra fee. Groceries and permits are available at the Lazy Trout Market in Greer and larger grocery and drug stores, fuel, etc. are located in Springerville/Eagar 20 minutes away. We had so much fun...even though it rained most of the time. The on-site management was great to work with. They were very accommodating and helpful. The cabin offered a deck with a beautiful view. Will definitely stay again! Thank you so much for taking the time to give us your feedback. We are so glad to hear you had a great time and that our managers were helpful. We hope to see you again soon! We loved Greer, the weather was great. Not so happy about the cabin when we arrived. the managers were not there when it was check in. they left the cabin unlocked and the key on the coffee table. when we first walked in there was a very strong smell of something that was burned in the microwave, the plate in the microwave was not the correct one. the fridge shelf on the door was missing the bar to hold items on the door. the oven had foil on the bottom of it for spills but was covered with burnt on food the foil should have been removed and fresh foil put down. old coffee filter was still in the pot. In the living room there were ashes from the wood burning stove on the carpet and the coffee table was covered with it. We went to vacuum it up and the vacuum, bag was so full you couldn't even push. the stairs looked like they have not been vacuumed in a long time. That was just some of the issues we noticed. When the managers came back to the office I asked them about the ashes that were left in the wood burning stove and he replied that there weren't that many to have to clean out. I also told him about the microwave and he said someone broke the glass plate in it and they brought one down that they found, but it didn't fit. He did come back with a new microwave to replace for us. For the amount that we paid for 3 nights, the place should have been kept up and I even paid for the so called cleaning service. Cob webs all over one of the bedrooms, the dresser up stairs did not have a bottom on the drawer. this is such little things that should have been taken care of before our stay, the manager told me that they did a walk thru before our arrival and that it was cleaned. I can say the beds were clean and comfortable. I have dealt with home away a lot and have never been disappointed, except for this stay in Greer. I will contact the owners and let them know that the up keep of their cabin is not happening. I can't thank you enough for your review. We have received great reviews on our other cabins and I am very sorry to hear that the cabin was not in it's typical condition for your stay. This historic log home is beloved by many repeat guests but it sounds like housekeeping missed several cleaning and that some extra maintenance is required at this time. We have addressed these items with our managers who will follow up with you. In regards to check-in, our managers are periodically out and about conducting maintenance, buying supplies, etc. Guests check in at all hours of the day so it's not always possible for them to be in the office. Because Greer is a small town, the cabin is left unlocked with the keys on the table just prior to check in time. I am happy to hear that they replaced the microwave in a timely fashion. Greer is a beautiful place so we are glad to hear you enjoyed it and hope to have the opportunity to give you a better stay in the future. Thanks again for taking the time to let us know the details of your experience. The stocked fishing pond was an exciting time for the boys. Cabin 6 is definately rustic~we loved the wood burning stove! We were last minute visitors and were very pleased with the clean, fully equipped accommodations. Would definitely consider a return. The cabin was roomy, comfortable which made for a pleasant stay. Two items: the wi-fi was intermittent, but this may be due more to Greer's remote location than with the property. Management was most helpful in trying to resolve the problem and we usually (though not always had wi-fi). Secondly, put a few more lamps in the living room and bedrooms for reading after dark. Otherwise an excellent experience. Thanks. Thank you so much for your feedback! This is a special cabin. The third oldest in Greer. The WiFi is affected by the maximum capacity in Greer and the weather. Glad to hear our managers were so helpful. We will address the lighting. Hope to see you again soon! Thank you so much for your review. We think our managers give incredible service to guests but it's nice hear it. Greer is a mountain village with hiking trails and lakes a short walk or drive from the cabin. There is a local market, a few restaurants and gift shops in Greer. A ski resort with year-round activities, large grocery and drug stores, movie theaters, golf facilities, hospitals and several lakes in the National Forest and on the Apache Indian Reservation are a short drive away. Greer is in Area #1, one of the best Elk hunting areas in the Arizona White Mountains. 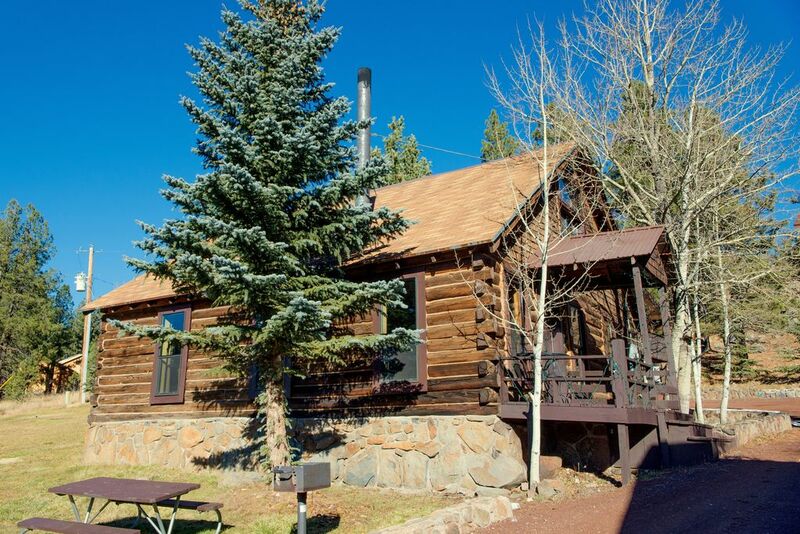 This cabin is located within Antler Ridge Cabins, an 8-cabin rental resort. There is an on-site management office for check-in and check-out, supplies, movies, games and assistance with the cabin. Cabins are cleaned after check-out and during extended stays. The cleaning fee is not included in the rate. Children 3 years and under stay for free. Military and seasonal discounts are available. Rates are subject to change until reservation is confirmed. Payment of 50% is due at the time of booking and balance due 14 days before stay. Refunds apply to the re-rented portion of your stay. Extra cleaning fees or damages may apply if the cabin in left in unreasonable or damaged condition.